The main reasons most people have difficulty when sawing metal are that (1) they aren't using a sharp blade; (2) there is too much flex in the blade; (3) the number of teeth is to great for the project; (4) they are putting too much pressure on the saw. We'll take them one at a time. Blades are cheap, so buy a box of them in at least two "teeth" numbers (more about that below). A box of 50 blades will cost you less than $15 and will probably last a lifetime. Better yet, buy two inexpensive hacksaws and keep different blades on each. 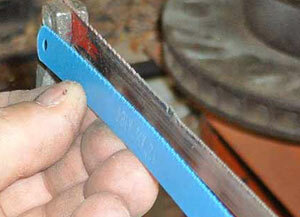 Dull, worn blades take a lot of work to cut, so change them as often as you would a utility knife or razor blade. Therefore, proper installation of the blade is very important. Don't just tighten the adjusting nut until the blade doesn't fall off; continue tightening until the saw frame starts to bend under the tension on the blade. That will keep it in correct adjustment for sawing. Blades come in several "pitches." That is, the number of teeth per inch. We keep two tooth-pitch sizes of blades in the Second Chance Garage, 18 and 32 teeth per inch. 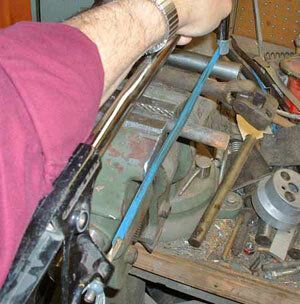 Generally, most cutting anyone does is just that - cutting off a pipe, rod or piece of channel. You want to cut it as fast as possible, and later on the edges will be ground or otherwise cleaned up. Therefore, the 18-tooth blade is what you want. It cuts quickly and leaves a "chewed-up" edge, but so what? All you're interested in is getting the piece cut off. When the teeth get worn down, replace the blade. Throw it away: don't "keep it for later." The blue blade is an 18-to-the-inch blade. The blade in the saw is shot. You can see that the teeth are worn down and the blade shows some breakage. The 32-teeth per inch blades are useful for cutting soft metals (aluminum, brass, etc.) or for making more precision cuts in steel. If a cleaner edge or a straighter cut is required, go with the finer blade. It will take much longer to cut but the results will be better. Wait a minute! Doesn't it make more sense that the greater the number of teeth the quicker a blade will cut? Yes it does, but in the case of hacksaw blades, the fewer teeth you have, the greater the "offset." It's like a rip saw vs a cross-cut saw. The more offset, the greater the chisel effect, and the faster the cutting. As for the act of sawing, bear in mind that the teeth face forward. Therefore, the cutting action only occurs on the forward stroke. You shouldn't be putting any pressure at all on the backstroke. When cutting, push firmly and run the saw as far along as possible to get the maximum area of blade working. Don't push down so hard that you bend the blade or encounter a lot of resistance while pushing forward. Let the blade do the work and be patient. Lubricate the teeth with a little oil or WD40 to cut down on friction and help remove metal particles from the teeth. Keep a constant pace (strokes per minute) without going so fast that you wear yourself down. Use both hands and move your body rather than just your arms. See how easy it can be? The cutting action takes place on the forward stroke, so don't add pressure while pulling the saw toward you.